In this edition of Sponsor Atlas: Selling to the Pharma Giants, we're visiting New York City's biopharma behemoth, Bristol-Myers Squibb (BMS). Their three-part name was born in 1989 merger between the Squibb Corporation and the Bristol-Myers Corporation, two NYC-based pharmaceutical companies founded in 1858 and 1887, respectively. The company has a rich history in America, with the Squibb Corporation being a major supplier of medicine to the Union Army during the American Civil War. While 55% of the company’s global sales remain within the United States , the company ranked 12th on the global list of highest earning pharmaceutical company in 2018 . BMS impacts millions of lives daily, both inside and outside of America. This article aims to shed some light on BMS’s current operations and future directions. To paint this picture, we will zoom out to provide a business overview, summarize outsourcing history, draw a map of distribution and global drug development sites, survey the decision-making tree and highlight some of the BMS’s current strategies for capturing innovation. As of December 31, 2017, BMS reported having 23,700 employees globally . The company’s main therapeutic areas are Oncology, Immunoscience, Cardiovascular Disease, and Virology. However, they have recently expressed intentions to shift focus onto Fibrosis as well . In 2016, BMS’s R&D expenditures totalled around $4.9 billion . Their pipeline currently has 33 compounds in development  and they have 561 active clinical trials. 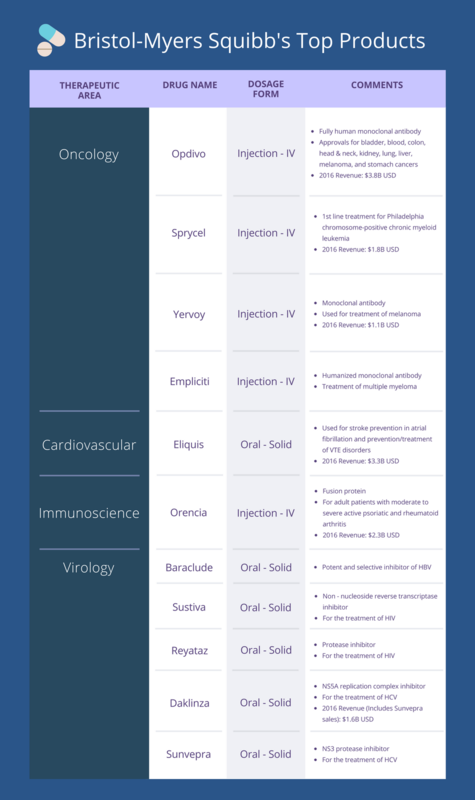 A table summarizing BMS' main pharmaceutical products can be found below. In addition to offering its own contract manufacturing services , BMS also has an extensive history of outsourcing to specialized contract research organizations (CROs), contract manufacturing organizations (CMOs), and other partners. Last year, BMS sold its manufacturing plant in Swords (Ireland), further solidifying their intention to transition more towards external production rather that in-house. This is a promising development for organizations looking to partner with BMS. BMS has a history of entering into “preferred-provider” arrangements with companies with which they have had previous successful business agreements, particularly with CRO partners. Partnerships between BMS and CMOs are less frequent, but they should increase with the new directive. There are multiple examples of short-term contracts with BMS leading to preferred-provider relationships. In 2011, CROs Icon and PAREXEL were selected as BMS’s preferred providers for full-service clinical pharmacology and exploratory clinical studies, following 3-year contracts (beginning in 2010) where the firms provided joint strategic, operational, and capability support for BMS’s clinical-development program . In 2013, CRO LabCorp entered into a 5-year agreement with BMS for full-service global central laboratory services and biomarker testing for early and late-stage programs; this agreement also followed previous partnerships between the two . 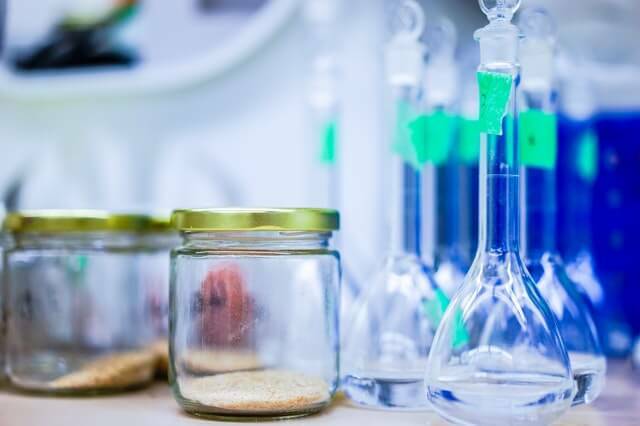 Additionally, in 2014, CMO Lonza secured a multi-year contract with BMS which allowed them to expand on an existing biologic manufacturing partnership they had with the company . Preferred-provider partnerships with BMS have prompted some CROs to develop dedicated facilities for servicing BMS. In 2011, BMS also entered into a preferred-provider arrangement with the CRO WuXi AppTec for stability studies of small-molecule new chemical entities. Because of this partnership, WuXi built and staffed a 25,000-ft2 cGMP facility for stability and analytical testing in Shanghai, exclusively dedicated to BMS. Similarly, in 2009, CRO Syngene International (another preferred-provider of BMS ) opened a 200,000-ft2 facility in Bangalore (India). This facility is exclusively dedicated to discovery and early-drug development for BMS . BMS also has a history of long-term partnerships with companies in areas outside of contract research and manufacturing. In 2008, for instance, Accenture secured a 10-year, $550 million partnership with BMS for a financial/accounting and application development and maintenance services in their American, Asian, and European markets . Do you have a Zymewire account? Click here to view all of BMS' global activity! 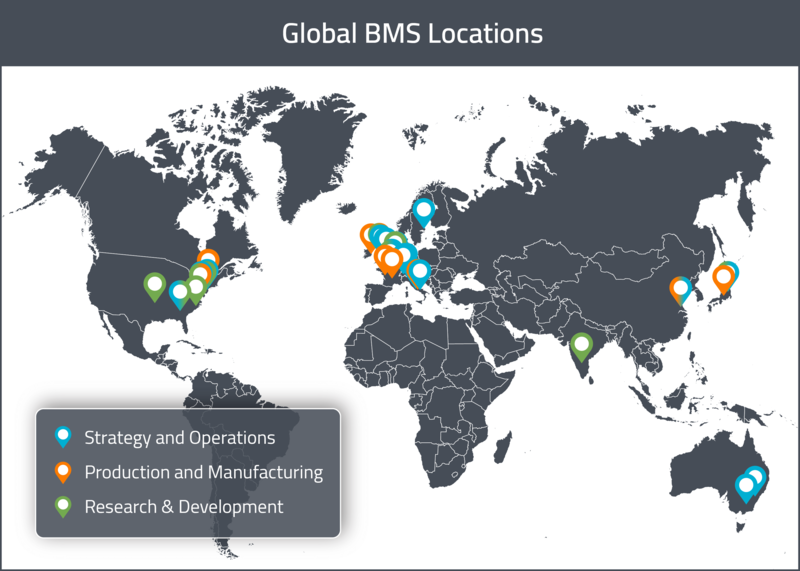 BMS has multiple specialized sites in each of its three major global markets (United States, Europe, and APAC). Some sites focus on drug development and/or manufacturing, whereas others are operations or distribution sites. 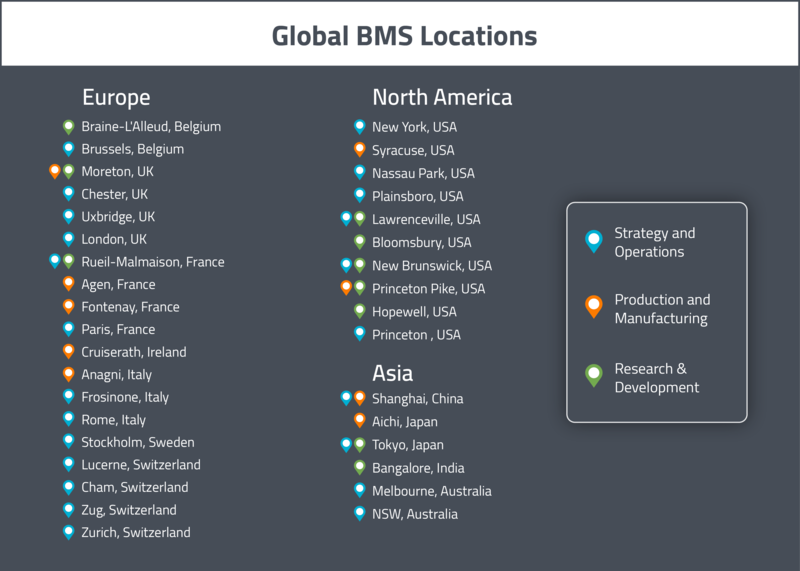 In this section, we will provide a map of all of BMS’s major sites across the globe. For a visual representation of these global sites, see the map below. BMS’s corporate headquarters is in the United States in New York (NY), and they have operations sites in Nassau Park (NJ), Plainsboro (NJ), and Tampa (FL). American manufacturing sites are located at: Humacao (Puerto Rico), Syracuse (NY), Manati (Puerto Rico), and Devens (MA) (Biologics Focus). American drug development sites are located in: Redwood City (CA) (Antibody Focus), Waltham (MA) (Biologics Focus), Lawrenceville (NJ) (Early Discovery Focus), Bloomsbury (NJ), New Brunswick (NJ), Cambridge (MA), Hopewell (NJ), Seattle (WA) (Therapeutic Proteins Focus), and Wallingford (CT). They also have a joint manufacturing and drug development facility in Princeton Pike (NJ). The United States are home to the largest number of BMS sites. The current number of sites in the USA is 18, however they plan to close three of their drug development/discovery sites in the near future (those in Hopewell NJ, Seattle WA, and Wallingford CT). BMS’s European Headquarters are located in Rueil-Malmaison, France, where the company also does some drug development work. The Global Headquarters for External Manufacturing is located in Cruiserath, Ireland. European manufacturing sites are located in Agen (France) and Anagni (Italy). BMS has a joint manufacturing and drug development site in Moreton (England) and a dedicated drug development site in Braine-L’Alleud (Belgium). There is also a distribution site located in Fontenay, France. BMS currently has only four sites in Asia. There are manufacturing sites in Shanghai (China) and Aichi (Japan). There are drug development sites in Tokyo (Japan) and Bangalore (India). Decision making has been classified into three sections: clinical outsourcing, manufacturing and logistics. This is to facilitate outreach efforts by different types of companies looking to sell to or partner with BMS. The general trend encompassing all types of decision making at BMS is that the vast majority of American decisions seem to be based out of the Greater New York Area. There does not appear to be a singular focal point for European decision making; main decision-making hubs appear to be Switzerland and England, with some decisions comings out of France and Italy. APAC decision making is limited to a regional level within Tokyo (Japan), Shanghai (China), and Melbourne (Australia). For North America, clinical outsourcing decisions are based primarily out of the Greater New York City area. There are multiple Outsourcing Managers operating out of New York and Princeton, New Jersey. The Head of US Outsourcing Management is based out of Lawrenceville, New Jersey. The Head of Clinical Partner Management is in Greater New York Area. The Global Head Clinical Operations and Director Business Operations and Outsourcing Management are both based in Princeton, New Jersey. European clinical outsourcing decisions do not seem to stem from a specific location; decision makers are spread out across France, the UK, and Switzerland. The Director Outsourcing Management and the Director Global Clinical Operations are both located in Rueil-Malmaison (France), the Director Service Provider Management is based in Chester (UK), and there is a Contract and Outsourcing Specialist in Stockholm (Sweden). In Switzerland, you’ll find Global Vendor and Outsourcing Management team in Lucerne and a Vendor and Outsourcing Management team in Zurich. For APAC, a Global Outsourcing and Regional Specialist is based out of New South Wales (Australia). North American manufacturing decisions are spread out, with key decision makers in New Brunswick (NJ) and Devens (MA). The Director of Pharmaceutical Manufacturing and the Head of API Delivery R&D External Manufacturing are based in New Brunswick (New Jersey). The Director of Biologics Manufacturing and the Director of Biologics External Manufacturing are based in Devens (Massachusetts). In Europe, External Manufacturing decisions appear to be based largely out of Switzerland. The Director and Head of External Manufacturing is based out of Cham (Switzerland) and leads the External Manufacturing team which is comprised of 60 individuals. An External Manufacturing Director is based out of the Frosinone Area in Italy. For Asia-Pacific, an Associate Director External Manufacturing is in Shanghai (China). 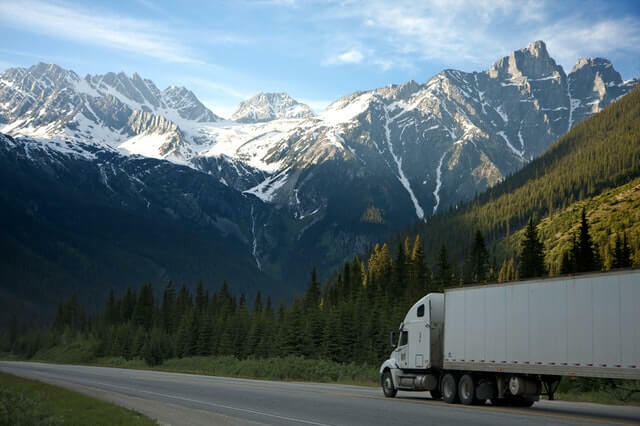 As was the case for manufacturing decision-making, logistics seem to be based out of the Greater New York Area with some of decision-making occurring in the Devens (MA) area. The Executive Director Global Procurement is based in Lawrenceville (NJ), the Director Global Procurement in Princeton (NJ), and the Executive Director Operations Procurement is in Devens (MA). In Europe, there are many logistics decision makers spread out over several different sites. In France, there is an Associate Director Procurement in Paris and a Head of Procurement in Rueil-Malmaison. In the UK, there is a Manager Logistics and Procurement and a Clinical Supplies Operations Logistics Manager in Chester. There is also an Indirect Procurement Lead in London and a Regional Director Global Procurement in Uxbridge. In Brussels (Belgium), there is an R&D Logistics Manager and a Director Regional Logistics. In Frosinone (Italy), there is a Manager Global Procurement Packing. Finally, there are Global Procurement Specialists in Zug (Switzerland) and Rome (Italy). For APAC, there is a Supply Chain Director and a Director of Global Procurement in Tokyo (Japan). There is also an Asia Pacific Logistics Senior Director in Shanghai (China) and a Strategic Sourcing and Procurement Specialist in Melbourne (Australia). Following the recent push for pharmaceutical companies to establish a presence in innovation districts, BMS has initiated an effort to break into the Boston (MA) life sciences innovation hub. In March 2016, the company teamed up with LabCentral (a shared lab space and incubator for life-sciences and biotech startups) to launch a Golden Ticket program . This program will allow BMS to nominate 2 startup companies annually to take up residence in LabCentral’s Kendall Square facilities. This year, BMS opened a new state-of the-art research site in Cambridge (MA), another life sciences innovation hub. Another way BMS is chasing innovation is in its increased focus on the innovative field of immuno-oncology. This is a new and dynamic application of biotechnology which has the potential to revolutionize the field of cancer treatment. BMS has taken steps to position itself as a leader in this field and already has several immuno-oncology products on the market. To identify additional breakthrough technologies and establish itself as an innovator on the European market, BMS has entered a strategic partnership with the European Healthcare Fund Life Sciences Partners . The focus of this partnership will be on immuno-oncology and unmet medical needs (especially cardiovascular diseases, genetic diseases and fibrosis). 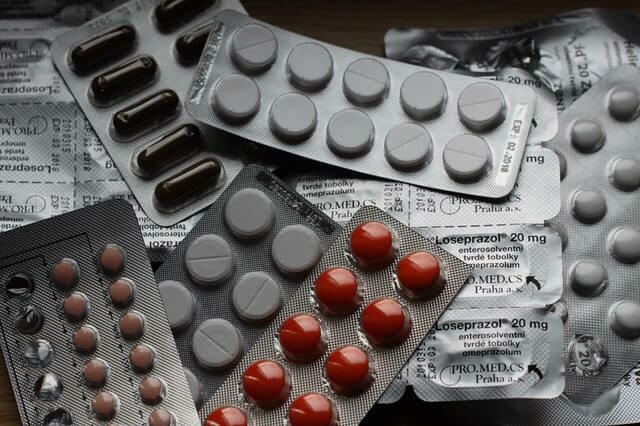 If you would like a simple solution for keeping an eye on drug sponsor companies, like Bristol-Myers Squibb, without relying on a database and generic lists of leads each week, we at Zymewire are here to help. Reach out today, and stay tuned for the next instalment of Sponsor Atlas: Selling to the Pharma Giants. If you enjoy these articles, please feel free to give them a share through the social links below! To view Part 2 of the Sponsor Atlas series, Started From Aspirin™, Now They’re Here: A Map For Selling To Bayer, click here!